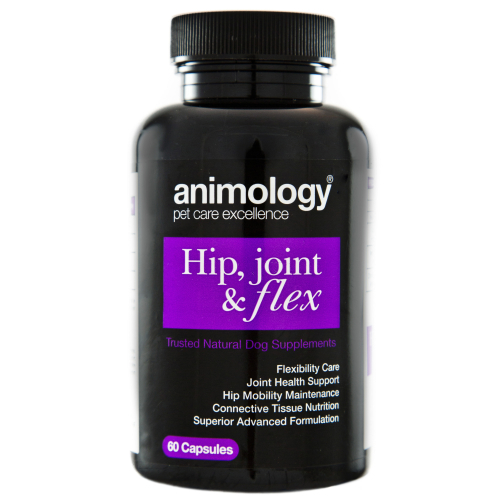 Animology Hip, Joint & Flex supplement provides incomparable nutritional support which helps better the overall condition, health and flexibility of your dog! This supplement contains the Glucosamine and Chondroitin, which are the two most common ingredients used in joint supplements. As well as MSM and Natural Vitamin E for superior joint and flex care! Animology vitamins and supplements are the essence of their commitment to pet care! Animology supplements offer industry leading, quality formulations which are totally natural, free from artificial colourings, flavourings and sweeteners! These supplements are simple to feed to your dog, and are provided in a capsules which contains a measured dose of the special blend! This can be given to your dog as a whole, or you can easily break it in half and mix the powder contents in your dog’s food or water!